“Why do you love your older home? I’d venture to guess that it’s all about the charming details that give it away as a house that was built 50, 60, 70 years ago. You don’t have to be an architect to appreciate the subtleties that, taken as a whole, exude a richness that’s often absent with more contemporary materials. Back in the day, a house with true-divided-light windows, real lap siding (made of 3/4” thick planks, as opposed to thin cement board siding), and chunky, substantial trimwork was the norm, and the deeper shadowlines and sense of craftsmanship simply presented a more comforting and engaging image. Home design was as much about creating a pattern of light and shadow as it was about creating comfort. In future blog posts we’ll discuss all these different aspects, but today I want to highlight one seemingly minor detail that makes or breaks that perception of ‘genuineness’: the proper use of window shutters. .
“Granted, most of our mid-century modest homes aren’t in the same category as historically designated ones built a hundred years ago. And for some styles such as Arts & Crafts Bungalows, or Mid-Century Modern, shutters are totally inappropriate. But if you happen to own the sort of Neo-Colonial or Cape Cod revival styles Royal Barry Wills popularized (or, more likely, some kind of modest hybrid cobbled together by a ‘merchant builder’), then they are likely just the right thing to dress up your windows, and your house will thank you for lavishing the same kind of attention to detail on it. Cheap shutters, which are so common that many people don’t even question the look, can give a flat, pasted-on appearance; authentic ones can make all the difference. By attaching with actual hinges, either working or simulated, the shutters will be slightly folded back against the wall; again, giving a greater sense of depth than the “wallpapered-on” fake ones (as well as letting air behind them to avoid rot). Pivoting tie-backs (“dogs”) are attached to the wall and hold them from swinging in the breeze. Ideally, you should also have some sort of slide bolt that would keep them latched, if closed. While the cost of such accessories can certainly add up, if you’re serious about the details they are worth the investment, and available from numerous sources such as this one. 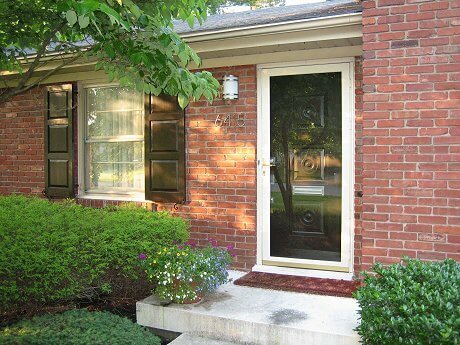 “Perhaps the most commonly used shutter style is louvered. If that’s the one you choose, you should look for well-made versions of wood or high-quality synthetic material (not the cheap vinyl clip-to-the-wall version). You want them to last many decades; I’d recommend two coats of primer followed with your preferred color of topcoat. With louvers, a paint sprayer will avoid a whole lot of frustration com-pared to trying to get a paint brush into all the nooks and crannies. Consider adding a tilt-rod [as in photo below] so that they look like they could actually operate just like “plantation shutters” on the inside of your home, and mount them opposite to the way the louvers are typically tilted: think about it, if most fake louvered shutters were actually closed in a storm, the louvers would pour water right down onto the window instead of shedding it away! ..“A third style are paneled shutters, which can look quite elegant, as with reader David Bramblette’s home [in photo below]. Along with faithfully following all the other shutter ‘rules’, his wonderfully mimic the panelling in the front door. (The circular detailing inside the squares, which I’m guessing David omitted for simplicity as he made them himself, is actually something I prefer; instead of being a slavish copy of the front door, they instead echo it. 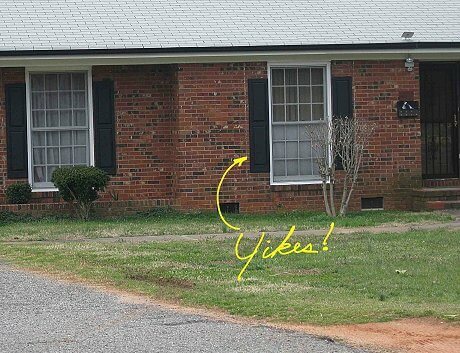 “So…..how to handle the inevitable problem where some windows are double-wide? To flank them with shutters (even though it’s often done) makes for an odd look. You could construct shutters that look obviously as though they’re double-folded, similar to an accordion door, that would theoretically cover all the windows if closed. It’s a tough call, but my personal advice is to simply avoid shutters completely, with double- (and certainly triple-) wide window units, or in a case where there’s just no wall space at all on both sides of the window. Step back and consider the overall composition of the windows in the facade and the effect of which ones will have shutters and which may not, in terms of visual balance. (You may want to avoid shuttering the oddball out-of-place window to avoid drawing attention to itself, rather than dutifully mounting shutters at every window.) If you have that rare case of a home with a Caribbean or South Florida flavor, you might consider louvered Bermuda shutters that are hinged at the top, or consider if other options for dressing up the windows (planter boxes; fixed awnings; paint color choice; slightly different surrounding trimwork) are suitable or even necessary for your style of home. Ted Cleary, ASLA, is principal of Studio Cleary Landscape Architecture. His guest blogs appear every month, on all things related to landscaping, exteriors, and curb appeal for Mid-Century Modest and Modern homes. Scott adds curb appeal to his midcentury modest house — amazing transformation! Ideas to address a big bow window with no panes that open for ventilation? Hey, Gavin! Can I send you a picture of our house to get your opinion please? We recently moved into an all brick ranch. The brick is not our favorite color, but still like the style. We want to give the front a facelift. I as thinking adding shutters next to Windows and maybe even paint garage door. Also adding updated larger lights. Can I get some suggested colors for the shutters? Maybe even get the color on my picture to see. I am painting the exterior of our ranch home in CA & would love to send a picture of our windows for a recommendation on new shutters! We have old wood ones that need replacing. The windows are a combination of casement style and a very tall & wide window that I’m not sure what to do with. 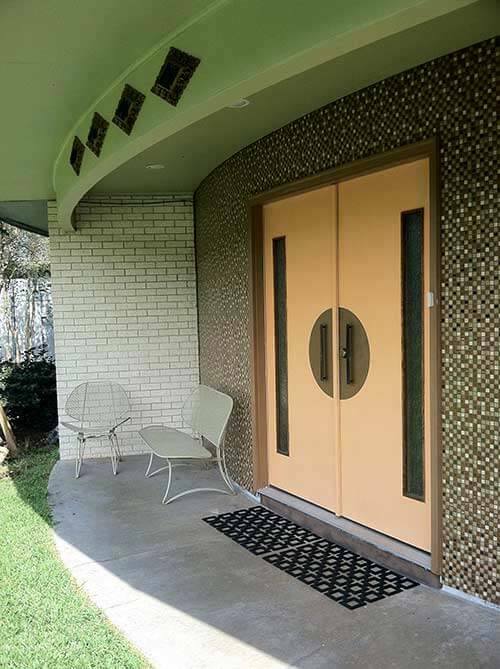 I really wish that I could find more info and examples of mid century shutters. 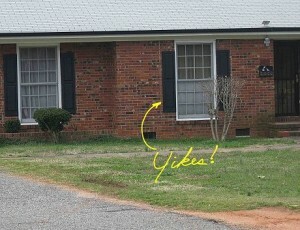 We’re going to take out 1960 ranch house back to its roots and get rid of the black shutters and do something authentic. I live in Lodi CA and there are SO many awesome houses here that still look very mid century and some with ornate shutters that I want to copy. I dont know what to call this kind of shutter thats like a frame with a shape inside, and some are flat plywood with a cut out. 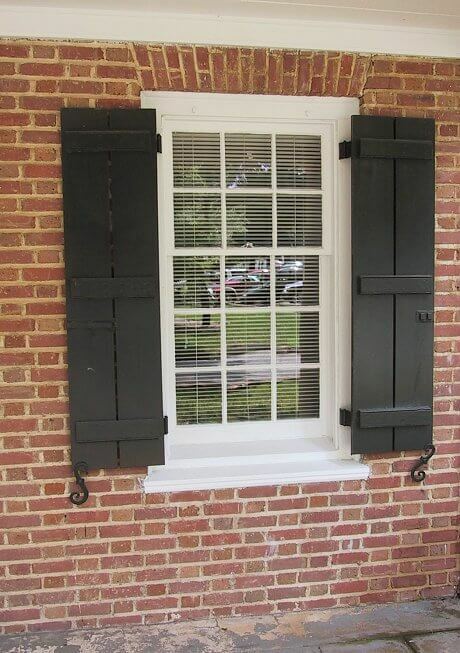 Every time I Google shutters I see the kind of louvered shutters. I want to see more of the cute decorative type shutters. We are on the same wave-length. 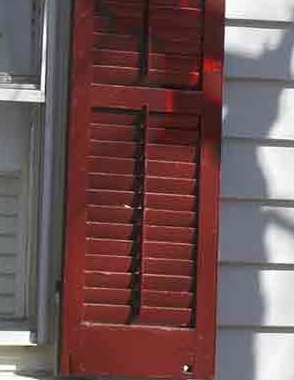 I am also looking for mid-century style shutters. Our ranch has been updated with the charm removed…along with any indication of its style. I wish I could see the type/style shutters you have in your neighborhood. You could probably hire a carpenter to mimic the shutters you like. Send us a picture and we can build them for you! Timberlane Shutters are always custom builds, and we have a lot of experience creating replicas. Check out our website to learn more; we’d be happy to help! Also, great points in this post! 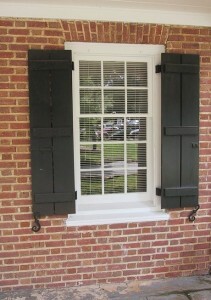 Functional, properly sized shutters really do make a huge difference to a home’s curb appeal. 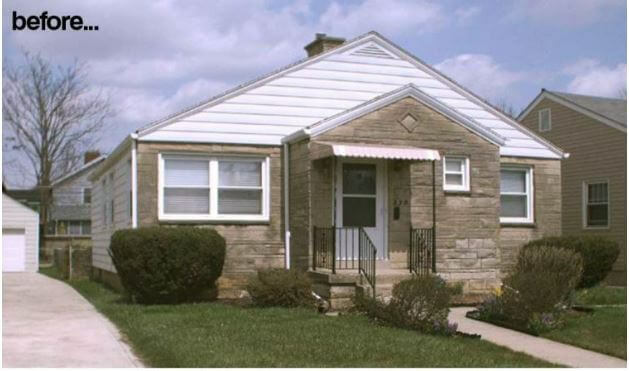 We have a federal style, red brick, two-story house. The front porch is a half circle with two columns. There are two 83” wide windows, top and bottom, on each side of the porch. The windows now have aluminum awnings which are in bad shape. We are having difficulty finding awnings in our area. Would it be okay to use shutters? Also, black or white? Alternatively: 2″ aluminum blinds inside the windows…. ?